If you’ve been turned down for life insurance due to sickle cell anemia or sickle cell, there is hope. We represent some carriers who will offer affordable coverage to certain individuals, depending on age of diagnosis, history of complications, and they type of sickle cell you have. As medications and treatment plans have improved recently, individuals with sickle cell or SS now have markedly better life expectancies into their 60’s and beyond. With merely the trait, no penalty will be applied to your health classification. You can qualify for preferred rates, in fact. If you have sickle cell (SC), and you have a mild to moderate case, you may only get a mild substandard rating. To get an idea of the premium you’ll pay, just run some quotes at Standard class and add approximately 50% to the premium. Not too bad. Mild to moderate sickle cell would be defined as current Hb readings 10 or more, and HCT more than 32%, with only mild history of complications. Severe cases will be declined for traditional types of insurance, but policies with graded death benefits may be available. 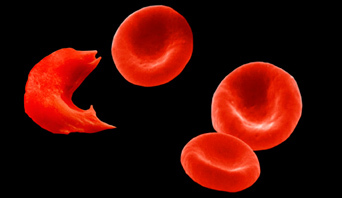 As you know, some complications of sickle cell disease may be painful crises, lung scarring, thrombosis, necrosis of the bones, and leg ulcers. Obviously, the absence or minimization of these affects will increase your odds of approval. In a best case scenario, if there is no evidence of any history of anemia or crises, you could qualify for the best preferred classes. With sickle cell anemia, and we’re talking adults here (as children under 15 will be declined due to elevated risk), again, it will depend on your Hb and HCT levels being high enough. If they are, you’re looking at a substandard case, such as Table D.
If you would like a personalized quote, it will be important for us to collect information on the history of your painful crises. Although almost everyone with SS or SC has experienced a painful crisis, the severity and frequency varies greatly among patients. Some individuals can go years without experiencing an episode. Your best scenario is it’s been more than a year since your last episode, and if your symptoms have never been so severe as to land you in the hospital. You still may be able to qualify for life insurance if you’ve needed a bone marrow transplant or stem cell transplant in the past to control your sickle cell anemia. In fact, you can be a mildly substandard case as early as 6 years post treatment, assuming no complications and Hb consistently over 10. Obviously, the presence of other health issue presents a problem. Just because you may qualify for, say, a Standard rate with controlled sickle cell disease, does not mean you will still qualify for Standard if you’ve also had a history of heart disease or obesity, for example. Since smoking is so bad for people with sickle cell, it will be nearly impossible for you to be approved if you also smoke, so don’t do it! Your goal as someone who suffers from SS or SC, and who wants life insurance, should be to be compliant with every recommendation your doctor makes. If you are supposed to drink 8 glasses of water every day, and take Hydrea, antibiotics, or whatever else is prescribed to you, a life insurance underwriter is going to want to see that your medical records reflect you are following those orders to the tee. For a personalized quote with sickle cell disease or any other impaired risk case, please call us at 877-996-9383. If you liked this post, please like it on Facebook or share it on Google +1. Thank you!